If you were flying United Airlines Sunday night, chances are you may have been delayed. A computer outage grounded all of United’s domestic flights for more than two hours, according to this NBC report, though the glitch affected only aircraft on the ground and did not impact international flights. The ground stop was issued after the Aircraft Communications Addressing and Reporting System, or ACARS, had issues with low bandwidth, NBC said. This is not the first time that a computer glitch or system outage has affected United’s operations, or indeed those of other airlines. Allianz warns that in today’s interconnected industrial world non-physical or non-damage causes of business interruption (BI) are becoming a much bigger issue. Physical perils like fire and explosion and natural catastrophes are still the top causes of BI that businesses fear most, but preparing for non-damage perils is becoming increasingly critical. This shift in BI risk means that intangible hazards, such as a cyber incident or interdependencies from global networks, can cause large revenue losses for companies without inflicting property damage. With this ever-expanding range of BI risks, it’s good to know insurers have you covered. Data Driven (Cyber) BI insuring loss of income and ongoing costs from interruption of business due to unavailability of data and computer systems caused by hacking, technical failure or human error. Additional resources on covering losses with business interruption insurance are available from the Insurance Information Institute here. Economic impact from business interruption (BI) is often much higher than the cost of physical damage in a disaster and is a growing risk to companies worldwide, according to a new report from Allianz Global Corporate & Specialty (AGCS). Its analysis of more than 1,800 large BI claims from 68 countries between 2010 and 2014 found that business interruption now typically accounts for a much higher proportion of the overall loss than was the case 10 years ago. Both severity and frequency of BI claims is increasing, AGCS warns. The average large BI property insurance claim is now in excess of â‚¬2 million (â‚¬2.2 million: $2.4 million), some 36 percent higher than the corresponding average property damage claim of just over â‚¬1.6 million ($1.8 million), the global claims review found. The vast majority of BI losses are not caused by natural catastrophes, with non-natural hazard events such as human error or technical failure accounting for 88 percent of BI losses by value. Reported loss estimates from the largest non-natural catastrophe BI events across the insurance industry during 2015 total more than $7 billion so far, with the Tianjin loss potentially accounting for almost half this total. 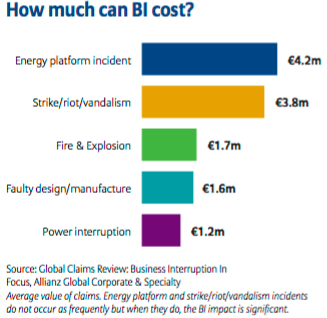 Fire and explosion is the top cause of BI loss around the globe by value (2010-2014), with each incident analyzed averaging â‚¬1.7m ($1.9 million) in BI costs alone, but there are some major differences regionally. Storm and flood related losses are notable in Asia, highlighting the region’s continuing economic development and increasing exposure to natural hazards. Storm is also the top cause of BI loss in the Caribbean and Central America region, accounting for one-third of insurance claims by value. The growth in BI claims is fueled by increasing interdependencies between companies, the global supply chain and lean production processes. Check out Insurance Information Institute resources on business interruption insurance here.